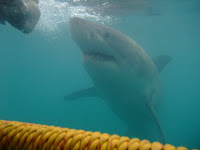 Congratulations to Alexius Sutandio who finally got to do a shark cage dive and see a 4m white pointer. Although he only got to see the one (small?) male shark, Alexius was thrilled to finally get some close-up shots of one. It all happened at North Neptune Island. Alexius couldn’t wait to post photos and video footage on his Facebook page. This meant that I could (sort of) experience it all for myself.